Over a year of searching for books written by David H. Lewis has finally resulted in success. Due to the popularity of our first re-print of David H. Lewis' book "Mysteries of the Pyramid" TGS set out on global search for any of this author's other works. The Days Before Tommorrow expands on the details in "Mysteries of the Pyramid," bringing the author's view of how Christianity plays a role in the prophecies. Admittedly the theories are not typical mainstream theologies which are popular today in Christianity, but Lewis has researched and presented his views very well in an easy to read format. 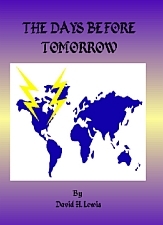 This book is an unparalleled documentation that envelops a brief history of our past, a panoramic view of our present and prophecies for the future. It is based on truth and should not be considered science fiction. It is the result of more than 31 years of intensive research--with data collected from ancient scrolls, records extracted from the hidden and recently discovered tombs beneath the Great Pyramid of Gizeh, the forgotten books of the original Bible and other manuscripts from all areas of the world. The Great Pyramid of Gizeh was not only a giant structure that accurately delineated our calendar year, but through its internal and external measurements (a formula of inches to solar years) it became a structure of prophecy--predicting the creation of Adam and Eve and all other major events through the ending of this civilization--which this generation will witness. This documentation covers man's reign on earth--his rise and his fall. It supplies evidence that announces the decline of free world governments, the collapse of the international economy, the depression years beginning in 1980, the coming rebellions and increased crime, our total population enslavement, the fall of the Apostate Religion and the final eruption of this civilization during the holocaust years. After reading this book, you will see a correlation with the Pyramid's prophecies, the Bible and other ancient records of mankind. You will learn the reasons for the drastic changes in our Society, our economic slump, world powers of every unrest, the ever-increasing starvation throughout all countries, the communistic influence infiltrating every avenue of our existence and--last but not least--the reasons for drug addiction and the rebellion of our young people. If this book has any purpose it is to show you what is before you: a continuing path of strife and greed or a path of true Christian love. Every one of us is a participant in greed and wrong doing on some level--I urge you to examine your life and try to reconstruct it around the positive assertion that you can make a difference in the future of the world. By your thoughts, action and will, man can make a mockery out of the prophecies of doom. Let us place the Lords of Greed and Apathy in chains and release the Light of Love. It will take a change of consciousness for the whole world--no small task! But God has never been able to deny His children what they ask in love. The earth is now arid and brittle; any sparks could kindle a great flame. Let them be the sparks of love. Even if the world doesn't change enough to alter its course of destruction according to the prophecies, you can change enough to assure your own release. Think about it. The clocks cannot be turned back and the science fiction "time machine" is not yet in operation. Man must take each day as it comes and try to make each day a step forward in faith. There is scientific proof now being gathered in support of the prophecies contained in the Great Pyramid with regard to our closing years and the disasters of the earth itself. Among our scientists there has been much speculation about the effects on the solar system in general and our world in particular when the planets all come to perfect alignment, as will occur in 1982. In that year Haley's Comet is due to return, in addition to the planets of Mercury, Venus, Earth, Mars, Jupiter, Saturn, Uranus, Neptune and Pluto lining up in a straight line. "As the planets move into alignment in 1982, their gravitational pull may cause huge storms on the Sun. These storms could alter wind directions on earth, reducing the speed of the planet's rotation and triggering serious earthquakes." First, it is noted ... there'll be a great increase in magnetic activity on the sun; huge storms, sunspots and solar flares will occur. The ionosphere may be seriously affected and great changes will occur in the Earth's atmosphere. Radio and television communications will be disrupted. Weird lighting effects from northern lights will burst through the sky. Wind directions will be changed (making thermonuclear radioactive dust far more dangerous to the western hemisphere). Rainfall and temperature patterns will be greatly altered. The two scientists are convinced and thus warn us that the earth's rotation will be effected and the length of our days will be changed. Solar activity in recent years has already increased the number of earthquakes and slowed our earth's rotation to a dangerous degree...but by 1982, there will be many violent earthquakes, large and small.... And one region where one of the greatest fault systems lies today, if put under a great strain, will create a great shock, especially in California and New York. Further severe shocks are scheduled for Florida and all eastern states, especially at the base of any city founded on strata of rock. Many thousands of people have given deep thought to the Bible prophecies of the earth being destroyed by fire, but cannot visualize how it would be accomplished. To give you an idea, I need only say that we are now living in the age of the atom bomb, the thermonuclear bomb and the neutron bomb. Man, at this stage of development, can utterly destroy this entire planet. "If enough bombs of the right size were set off, it will light the nitrogen chain and the entire world will go up in flames. And if other planets are inhabited, they would look and cry, 'Ah, a nova. A new star." Dr. William F. Libby, Nobel Prize-winning scientist, once declared, "Atomic and hydrogen bombs can create hell on earth in a way no man, not even Dante, has ever imagined. " We are warned that in the case of a single 100-megatron bomb, the resulting fireball will produce a temperature of 18 million degrees Fahrenheit. This heat and horrendous power is for more forceful than that of the bombs which we dropped on Japan, to say nothing of the intense radioactive fallout. In reality, a concussion of H-bombs in crucial areas WOULD blow our earth off its axis. You can see how man can self-destroy our world. Today there are 37 countries having the thermonuclear bomb...and if China, Russia or any other country begins to explode their powerful bombs, we will self-destruct. Man is rushing the year and hour of civilization's end with this fervent enthusiasm. These predictions by our scientists strongly confirm what is already indicated throughout the Great Pyramid of Gizeh. These signs are all prior to the actual holocaust; but as time passes, they become intermingled, creating a real "hell on earth"--the likes of which you would be unable to imagine. Honey will be much more expensive than was." This refers to conditions PRIOR to the holocaust, with the tribulations of starvation and the fall of the Apostate Religion. 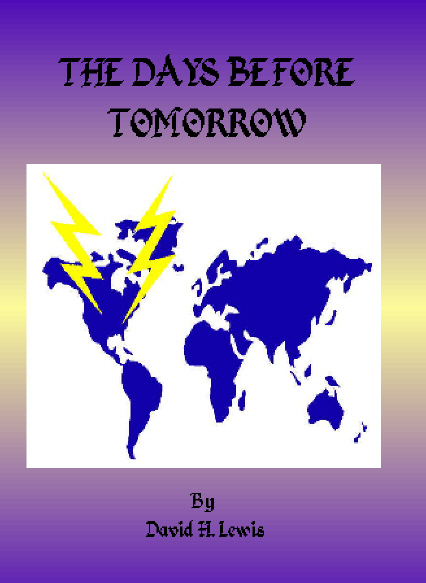 Along with these earth disturbances, there will be greater ones, which will have a far greater effect on our lives than earthquakes, floods or sun's eruption and radiation. These disturbances will be among us and among all nations, and they will bring on the final and terrible holocaust, to put an end, once and for all, to this civilization prior to the "Second Coming of Christ". The exact date of the holocaust is unknown, but it will be in its beginning stages by 1988. It will be intermittent over the years to the end, with more than one holocaust involved. Each series of wars--and there will be several--will be a holocaust in itself. The beginning of great changes has already begun, with minor and major earthquakes, floods and our recent (and, so far, minor) weather changes that have plunged the north into the worst winter in the lost 100 years. It is predicted that the winters will get worse as time goes on. The changes, although gradual, will start to become serious in the latter part of 1980. The years following this will become increasingly more alarming. With the changes of earth's surface, the severe weather conditions and the outbreak of wars, you may wish the end to be sooner than prophecied. The Son of the Messiah is due some time between 2001-3/4 and 2085, but no man shall know that day.